WASHINGTON, D.C. - In a world when many “catch” dinner between commitments, it is rare to find one seated in the company of good friends, shipmates, and guests under a common roof and at a common table. For the students, staff, guests, and partners of U.S. Coast Guard Auxiliary University Programs (AUP), March 23rd at the Fort McNair Officers’ Club in Washington, D.C. was such an occasion. AUP is home to the best, brightest, and most talented college students all across the country that work for a common goal: to serve their community and country, both inside and outside of the Coast Guard and Coast Guard Auxiliary. Pictured right: AUP students, staff, guests, and distinguished active-duty and civilian partners pose for a photo at AUP Dining Out, March 23, 2013 at Fort McNair. U.S. Coast Guard photo. Traditional dining out calls upon those in uniform from all services to gather together, along with guests, for a night of fellowship, introductions, reunions, and inspiration. It is a time to look back at past achievements and look ahead to future goals. Customs such as setting a table in honor of Prisoners of War and Missing in Action, tasting of the beef, and toasting were much enjoyed while AUP students had the rare opportunity to interact with fellow shipmates from other units and catch up with some of the AUP leadership. Pictured below: Auxiliary University Programs students enter the Officers' Club at Fort McNair for AUP's Dining Out event, March 23, 2013. 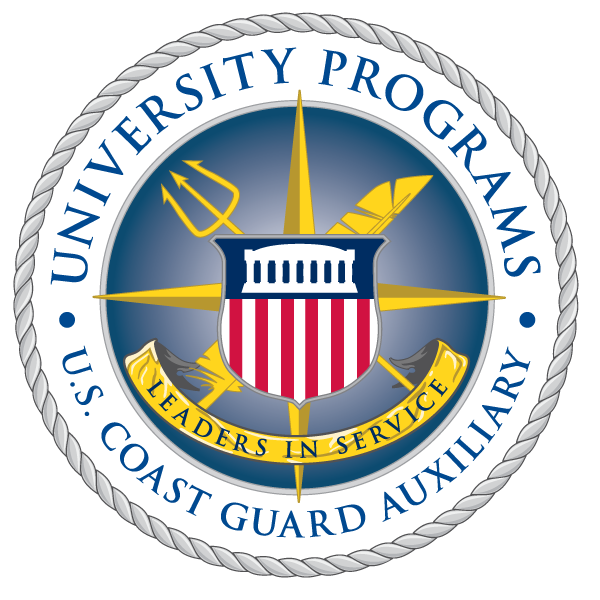 AUP prepares the best, brightest, and most talented college students for success in service to their community and country—inside and outside of the Coast Guard Auxiliary. U.S. Coast Guard photo by Auxiliarist Jonathan Roth. Looking ahead, AUP will seek to work at the crossroads of some of the nation’s greatest challenges in education, innovation, professional opportunity, and public safety through renewed focus on the Commandant’s priorities of sustaining mission excellence, enhancing crisis response and management, recapitalizing and building capacity, and preparing for the future. Welch also implored AUP students and staff to “think different” in devising creative approaches to shared challenges. Students are highly trained and ready to provide public safety and emergency services on and near the water. Utilizing the Auxiliary’s SkillsBank, an online database of talents and interests, units can utilize specialized talent wherever it is most needed. On campus, students have the opportunity to connect AUP academic courses with training in the field to become stronger leaders for their peers and prepare for future careers, civilian or military. Pictured right: Mr. Welch, AUP Division Chief, greets attendees to AUP Dining Out, March 23, 2013. Mr. Welch is a graduate of the College of William & Mary and now leads W&M, as well as many other university programs, in a unique opportunity for leadership, education, and innovation. U.S. Coast Guard photo by Auxiliarist Jonathan Roth. Pictured below: Students from Unit William & Mary converse with Lieutenant Geyer at AUP Dining Out, March 23, 2013. Lt. j.g. Geyer has served aboard Coast Guard Cutter Sycamore, home ported in Cordova, Alaska. U.S. Coast Guard photo by Auxiliarist Jonathan Roth. Guests representing the U.S. Naval Sea Cadet Corps also gave AUP students and staff a glimpse into other methods of engaging students, albeit younger ones, in the tradition of the sea. As the night drew to a close, Mr. Welch called up the leaders from all attending units to the front of the room. There, he handed off a large “Don’t Give Up The Ship” flag to the representatives from Units Washington, D.C., Piedmont, and William & Mary. “I want the AUP crew to own and pass this on to succeeding crews; I hope this will inspire you in hard times, when the going gets tough,” Welch said, as the students unfurled the flag famously displayed by Oliver Hazzard Perry during the War of 1812. Strengthening the AUP community through fellowship, dining out provided members of Team Coast Guard a setting to collaborate, network and interact with fellow Americans involved in serving their country every day. By taking these lessons to a field-level approach back in their units, AUP students continue to be leaders in service. Pictured right: Student leaders from AUP Units Washington, D.C., William & Mary, and Piedmont unfurl a "Don't Give Up The Ship" flag from Mr. Welch at AUP Dining Out, March 23, 2013. The gift is meant to guide the students in managing their respective units. U.S. Coast Guard photo by Auxiliarist Jonathan Roth.